Background checks may involve any of the below listed services, ONQPI will custom design a package to suit your needs and budget. Recommended for tenant screening, per-employment screenings and due diligence. NOTE: A background check can still be requested if you don’t have all the per-cursors as listed below. You provide us with a name and social security number, ONQPI will provide you with any bankruptcy filings for the last 10 years. You provide us with a name, social security number and a county, ONQPI will provide you with all civil suits that person was involved with in the last 10 years. You give us the name of a corporation, and a state, ONQPI will provide you with a list of corporate officers and addresses, date of incorporation, statutory agent and address, tax filing status, telephone numbers, and other relevant information. Fast service! You give us a name, social security number and date of birth, ONQPI will provide you with that person’s criminal history for the last 7 years. (Excluding driving record and traffic citations) Make sure you know who you are dealing with. You provide us with a name, social security number and a state; ONQPI will skip trace and provide you with that person’s current employer. Great for missing persons, skips, asset searches, child support collections and repossessions. You give us a name, social security number, date of birth and a state, ONQPI will investigate and provide you with a complete driving record in that state for the last 3 years. You provide us with a name, social security number and a state, ONQPI will investigate and provide you with all degrees earned by that person in that state. You provide us with the name, social security number of either party, and a County, ONQPI will provide you with the name of the other party, date of marriage / divorce, support and other pertinent information. 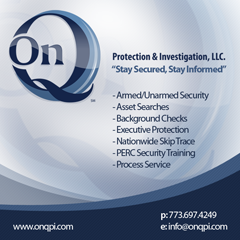 You provide us with a name and previous employer, ONQPI will investigate and provide dates of employment, termination reason, and other pertinent information. You provide us with a name, social security number, profession and a state, ONQPI will investigate and verify that required licenses are held by that person in that state. You provide us with a name, social security number and state, ONQPI will provide you with date of incarceration, projected release date, parole hearing dates, prisoner ID number, and mailing address. You give us a name and address (Current or old), ONQPI will investigate and provide you with the correct social security number for that person. You give us a social security number; ONQPI will investigate and tell you whether the SSN is real or fake. On real ones we will also provide the name of the person it was issued to, their age, the state the person lived in at the time it was issued, and whether the person is alive or dead. Great to use as a fraud detection tool. You give us a name, social security number, and a county, ONQPI will provide welfare recipient’s address and payment amount. You provide us with a name, social security number and a state, ONQPI will provide you with all case numbers in that state for that person in the last 10 years. You give us the name of a company; ONQPI will provide you a list of all uniform commercial code filings for that company nationwide over the last seven years.